Delight a friend with this mini olive - An ideal gift for gardeners and foodies alike! The perfect long-lasting gift for gardeners and foodies alike. Perfect in pots on patios. Lovely evergreen foliage for year round interest. 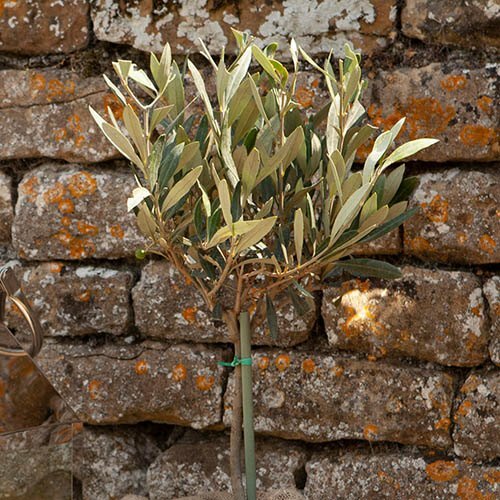 Supplied as a single olive tree 60cm tall inc pot, grown in lollipop standard form. The perfect long-lasting gift for gardeners and foodies alike, these great little olive trees will look fab on patios, balconies and decks across the country. Their lovely evergreen foliage gives year-round interest, and adds a touch of the exotic Mediterranean all year. A really nice gift to receive, the lucky recipient can put them straight outside - they look great in large real terracotta pots for that classic Italianate look. Easy to care for, in a few years in hot summers, they may get a few olives too! When positioning your olive, choose the sunniest spot available. We recommend that plants are given time outside in the summer to make the most of the available sunshine. Indoors, choose a sunny windowsill. During the growing season keep the compost moist and feed with a balanced liquid feed every month. Olives can be pruned in early spring and simply consists of a light trim to keep an attractive shape and to remove any dead, diseased or damaged branches. To restrict the size of a pot-grown olive, tip prune the main branches, cutting back to a good replacement shoot each year. Although olives are hardy, branches may be damaged by severe frosts, so bring plants in and overwinter in a frost-free place such as a sunny windowsill.